A laptop isn just a piece of electronicss also an investment. 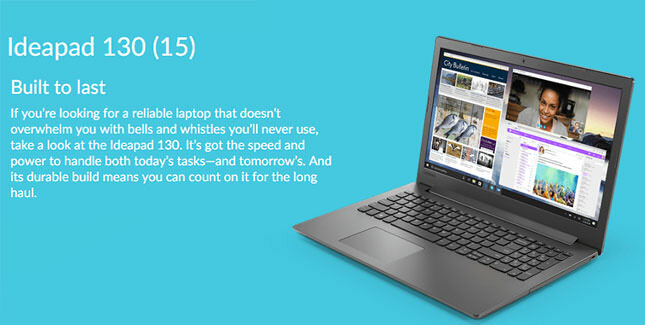 Thats why we designed the Ideapad 130 with a special protective finish to guard against wear and tear, as well as rubber detailing on the bottom to maximize ventilation and extend component life. Cutting-edge 8th Gen Intel Core processing, up to 12 GB memory, and a range of storage and discrete options means youll have the tech to support you well into the future. And with Windows 10 Home as your OS, youll have a familiar interface that keeps your laptop secure. Choose a model with a DVD drive for an easy way to watch and listen to the movies and music you already own and love.